I always used to consider barbecuing to be "man duty". I don't mean to be sexist by saying that. Growing up in Kentucky in the 70's, that's just the way it was. I have no idea why men and grilling were so inextricably linked during my childhood, but I can assure you that it had absolutely nothing to do with culinary prowess. My dad and Uncle Jim were completely inept in the kitchen (sorry guys), but that didn't seem to matter. When it was grillin' time they were ordered out of their lazy boys and sent outside to cook burgers, straightforwardly made from ground beef mixed with a healthy dose of Jane's Krazy seasoning. We always knew what to expect out of these patties -- nothing special. As I got older, I not only realized that barbecuing is not just for the boys, but I also discovered that burger making can be a heck of a lot more exciting than the ones I grew up with. Say you've got a crowd coming over this summer and want to serve them something a little bit jazzier than the same ol' burgers you're used to making. 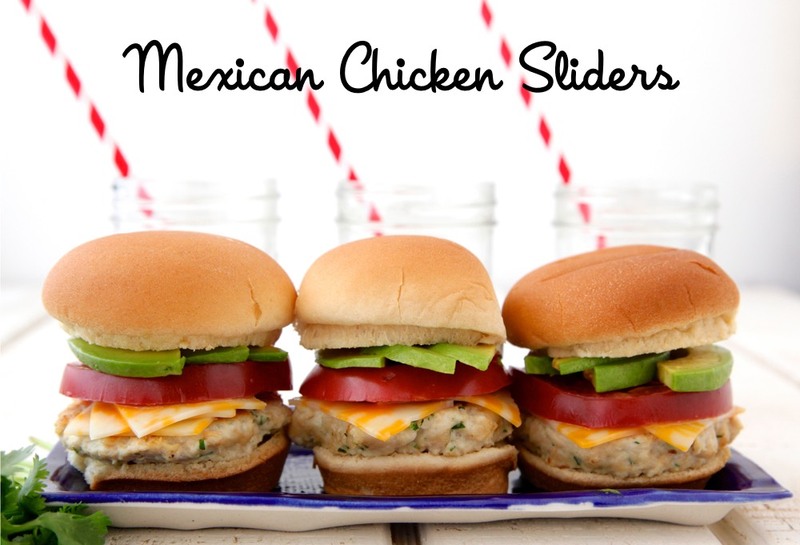 These Mexican Chicken Sliders are a great change of pace, made with juicy ground chicken and infused with south of the border flavors like fresh cilantro, cumin, garlic and onion. These mini burgers are so foolproof, I suggest you hand the boys the recipe and then send them outside so they can feel like they are fulfilling their manly grilling responsibilities. Meanwhile you can kick up your heels and have a good time! 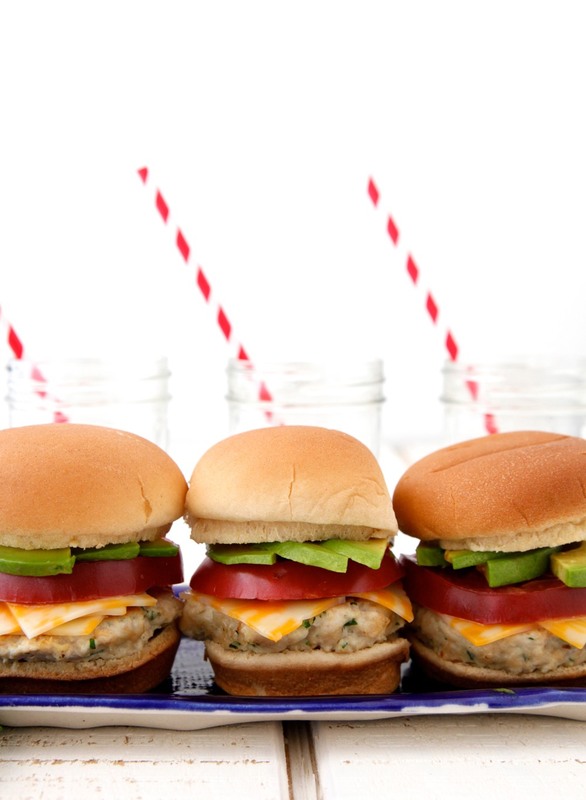 For more awesome slider recipes, check out the links below! 1. In a large bowl, combine all the ingredients, except the oil, and mix to thoroughly combine. 2. Divide the mixture into 8 equal portions and form into patties. You will use about 1/4 cup of the mixture per patty. 3. Heat the oil in a skillet over medium heat and cook for 3 minutes on each side, or until chicken is cooked through. I have been looking for some different takes on burgers and these look perfect! Love this! Any suggestions for oven cooking instead? Do u think this can be made with pork? I have not tested that, but I think if you could get your hands on some ground pork that's about the same fat content as chicken that it would work! I made these tonight and they were delicious. However, when making the patties I found that they were very sticky and hard to form. When I went to put them in a hot skillet they became totally unformed and I had to make the patties all over again. What am I doing wrong? If they're too sticky, try wetting your hands so that your hands stay clean and the mixture doesn't stick to your hands! Did you follow the recipe measurements exactly? The hot skillet should help to start cooking them immediately and not let them fall apart. These are delicious! Followed the recipe completely (thanks for the water tip) and topped them with sharp cheddar, tomato and guacamole. So good! Thanks! These look great! Can you suggest a temp and cooking time for making them in the oven? These aren't sticking together for me...it's almost like a soupy mixture...what did i do wrong? But who cares....because they jusy finished cooking and they came out amazing!! Soupy?! So weird! Did you add the oil into the mixture? That should be left out and used for cooking the patties. Did you use a whole pound of chicken? Yes! Shape into patties, place on a cookie sheet and freeze for about 30 minutes. Transfer to a ziplock baggie, label and freeze up to 4 months. When ready to use them, defrost in the fridge overnight and cook according to recipe directions. You can also cook them from frozen, adding at least 5 minutes to the cooking time! This is a regular on our dinner table!